As AMDA celebrates its 50th anniversary, AMDA alumni continue to impact Broadway and New York theatre with bold, captivating performances, prolonging AMDA’s rich history in the NY theatre scene. From The New York International Fringe Festival to hit Broadway productions, AMDA graduates help to shape works small and large, from Broadway theatres to cozy, intimate spaces dispersed throughout the five boroughs . We proudly boasted in a previous post that if you attended a Broadway show this past summer, you might find it difficult to miss one of our alumni. AMDA graduates performed in 15 of the 39 shows running at the time. A similar picture emerges for this fall: AMDA alumni appear in roughly one-third of Broadway productions—eight in starring roles! 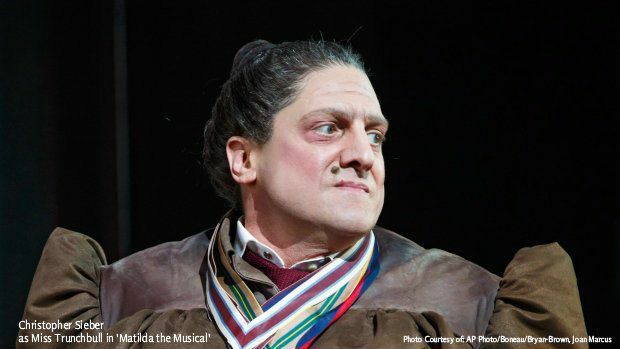 Here is a brief rundown of who you can expect to see over the next few months: Christopher Sieber, who has had an amazingly diverse Broadway career totaling 10 Broadway productions, continues his role as Miss Trunchbull in Matilda the Musical; Caissie Levy, known for her starring turns in Ghost the Musical and Hair, plays Fantine in Les Misérables (with alumnus Kyle Scatliffe as Enjolras); Gretchen Mol portrays Emily in Ayad Akhtar’s Pulitzer Prize-winning play, Disgraced, opening October 23, 2014; Emily Padgett stars as a conjoined twin in the re-imagined Sideshow, which begins previews October 28 on Broadway, after a recent successful run at the Kennedy Center; and Genson Blimline (Lonny in Rock of Ages) and Albert Guerzon (Eddie in Mamma Mia! ), also in featured roles, continue with their respective productions. Motown: The Musical, which opened April 2013 and stars alumna Krystal joy Brown as Diana Ross, now has four AMDA graduates. Ms. Brown took over the role of Diana Ross back on January 23, 2014. Her previous Broadway credits include Big Fish and Leap of Faith. Having recouped its $18 million investment, Motown: The Musical will take a break from its Broadway run at the Lunt-Fontaine Theatre after January 18, 2015, in order to streamline the show and reduce its running costs. So if you want to see Ms. Brown in another breakout role, you have the next four months to grab your ticket. Who knows what this young star will be doing when Motown: The Musical returns to Broadway in July 2016?